Linking up with the ladies as usual this Friday! two. Budgeting. As I mentioned earlier this year, I am going to be working on budgeting. This means using gift cards, not spending unnecessary money (ie Starkbucks, lunch out, etc), thinking about needs vs wants. I don't have the perfect game plan or solution yet. So as I figure it out I'll share along the way! Advice welcome! three. Yesterday was a gorgeous day! I took advantage of the weather and took Poppy for a long walk and then enjoyed dinner and drinks outside with a girlfriend at Selwyn Pub. As much as I loved the snow last week, I am getting excited for spring! Of course today we are having thunderstorms, so this southern weather is all over the place. four. I am sad the Olympics are almost over. I also can't believe we didn't get a medal in the women's skating last night!! I was also shocked that Yulia didn't medal. I think she is an incredible skater, I loved watching her. five. I'm having a flash sale on my bangles! 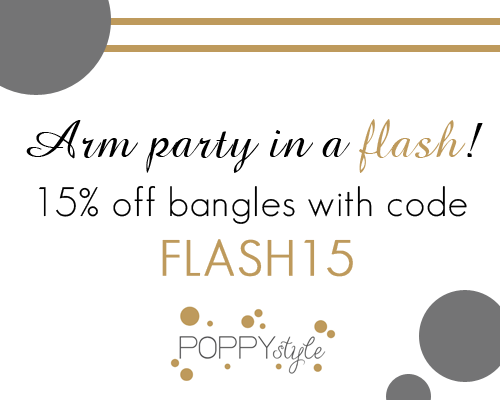 Hurry over to Poppy Style and take 15% off all bangles with the code flash15. I'm sad about the Olympics too and the girls I know! Totally heartbreaking! Let me know about your budget girl I am trying to be good and save for the wedding! stopping by from the Friday Five! I'm sort of sad about the Olympics too- I'm usually not a winter sports fan but I've enjoyed them this year. As far as budgeting goes it's hard but we try to have "no" months. Such as January was a no shopping month- meaning we were not allowed to buy things that we didn't need. It was much easier for my husband than me but it was fun to shop my own closet and made me appreciate my clothes more.